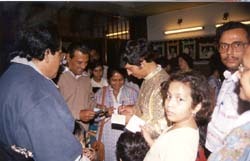 "Sorcarama: Magic Sans the Wand"
Manick Sorcar's SORCARAMA at Uttam Mancha theater, Kolkata, India, was a smashing hit!! 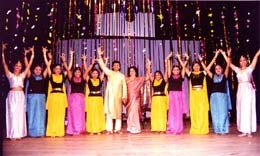 "The Hypnotizers Are Here" was the caption for the large 12" x 8" color picture printed by Ananda Bazar Patrika, the largest circulated newspaper of India, in welcoming the Sorcars to Kolkata to perform SORCARAMA. 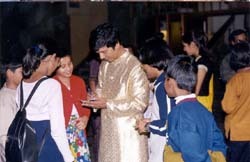 The people of Kolkata, India, were enthralled once more with the entertainment miracle of Manick Sorcar. "Sorcar's shows surpass traditional magic as he enthralls the audience with light, laser, animation and live performances" wrote The Statesman, a leading newspaper of Kolkata. Sorcar directed twenty shows in the jam packed theatre during his visit to India. This time Sorcar brought SORCARAMA, an entirely new show to his homeland, which took the Kolkata by storm. 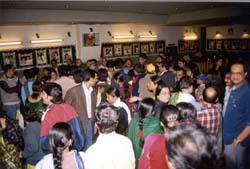 It ran non-stop for two weeks in a packed hall covering twenty shows December 21, 2002 to January 5, 2003, at Uttam Mancha theater. 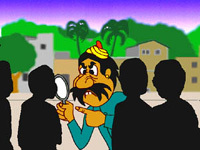 He also premiered Ekushe-Aine (Rule of Twenty-One), a brand new animation which he dedicated to the children of India. "The kids were laughing their hearts out" wrote Protidin, a leading newspaper of Kolkata. 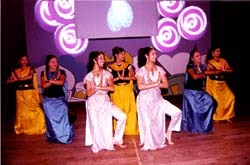 The show had two parts, separated by a short interval. In the first part, the audience watched an astonishing repertoire of his award-winning animation classics on large screen. 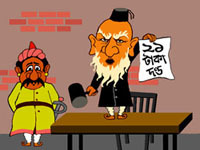 The highlight of this segment was the world premiere of Sorcar’s most recent animation Ekushe Aine (Rule of Twenty-One), based on the popular nonsense verse of Sukumar Ray. 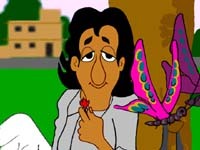 What viewers found most captivating here was the rich transference of Ray’s words into the new medium of animation where Sorcar brought out the cinematic potential of the works by viewing the original context through the lens of his own sardonic humor, as he enlivened Ray’s words with a world of humorous visual details. Audience appreciated the way technology met tradition to produce rich humor in Sorcar’s rendition of Ray’s nonsense verse. The second part of SORCARAMA is a journey to Sorcarland where live action on stage uniquely blended with spectacular laser shows, animation, and state-of-the-art intelligent lighting. 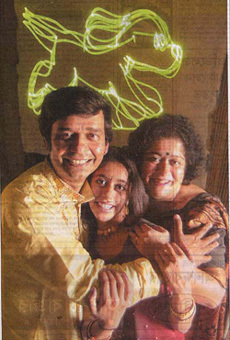 In his celebrated Dancing With My Soul the audience experienced life-size laser animation with live action for the first time in India. Other items in this segment transported the audience to a space of synergy filled with laser magic. In Underwater Fantasy, viewers were lifted from their seats to visit the ocean floor to experience the underwater creatures’ rescue of the fairy queen. 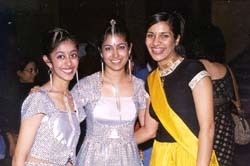 The dance sequences were choreographed Piya and Payal who have both been directing dance performances for over a decade now. City's leading newspapers including The Telegraph, The Statesman, Times of India, The Asian Age, Cine Advance, Ananda Bazar Patrika, Bartaman, Aajkaal, Protidin, Ganashakti, Vishwamitra, Sanmarg etc. gave rave reviews and featured Sorcar with special articles. The news was also flashed in national magazines such as The Week and India Today. 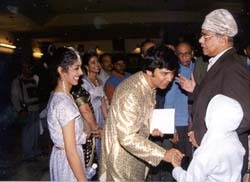 He was interviewed by several radio stations including All India Radio, and by all major TV stations, which also telecast parts of his unique show that kept Kolkatans spell bound the entire time. 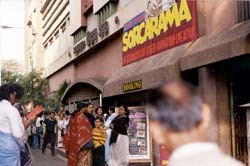 SORCARAMA ran packed house from December 21, 2002, through January 5, 2003, at Uttam Mancha, Kolkata, India, one show daily at 6:30 pm, twice on Saturday, Sunday, and holidays at 3 pm and 6:30 pm. Sorcar’s productions have repeatedly hypnotized the people of USA. His admirers in India promptly remembered in December 2000, Sorcar was sponsored by Biswa Banga Sammelan to share a handful of his animagic and Sorcartoons. That time, he enchanted Kolkata with his show Calcutta Forever: A Laser Fantasy, where he used cutting-edge technology to display the first-ever laser-animation inside a theater to portray the 300-year history of the city. That show was one of the highlights of the international conference that brought people of Bengali heritage together from all over the world to showcase the cultural depth and breadth of the Bengali diaspora. Sorcar’s show at the prestigious Nandan theater was originally scheduled to play two days at the conference, but by popular demand, it was extended to two shows daily for a full week. "..In his Rays of Synergy, right after the prayer lines, with the music-coordinated steps of the colorfully-costumed dancers, the brush of laser-light started to showcase his skill in animation...at the back, brilliant fire balls appeared on the large white screen and then disappeared as magically as they appeared..., a group of moon-like planets of light floated in space and then vanished in the side wings, and a stream of yellow light washed the stage down to the audience as if to rhyme with the famous verses of Nobel laureate Rabindra Nath Tagore 'Aloker Aie Jhharna Dharai Dhooiye Dao' ....Being an engineer, Manick walked in the opposite direction from his famous father and uncle who were magicians. Today he glows brilliantly with his own merit and own qualities....Through his innovative work Manick has proved even engineers can be a great magician!" "Manick Sorcar has established himself as the monarch of lighting art"
"Manick magic wand animates Kolkata"
"The greatest attraction of the City this winter is SORCARAMA"
"......He has created a different type of magic with color, art, and laser light....In the New Year, we salute the New magician of the New age"
"Creating brilliance...A two-hour laser animation and live action extravaganza, choreographed by daughters Piya and Payal, this is a first of its kind of show in India." 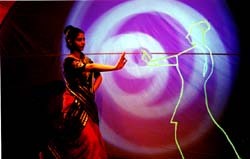 "He used modern technology of lighting and animation to showcase culture of India to the whole world. We offer our deep respect"